L: 48" x W: 2.5" x H: 81"
Slade Leaner Mirror This gorgeous Slade leaner mirror will reflect light and help give the illusion of greater space wherever it's placed. The beveled glass and antiqued-bronze finish attest its fine craftsmanship. This gorgeous Slade leaner mirror will reflect light and help give the illusion of greater space wherever it's placed. The beveled glass and antiqued-bronze finish attest its fine craftsmanship. As soon as I walked into Raymour & Flanigan entrance located on Niagara Falls Boulivard before my eyes I noticed I seen a beautiful reflection of myself along with the reflection astonishing reflection of the showroom threw this awsome Lean Mirror that caught my interest instantly. As I was slowly approaching the mirror like I was hypnotized by its beautiful elegant craftsmanship my mind was already made up to invest in this once in a life time piece of art crafted with a smooth and sleek bevel edges I instantly looking for my sales rep that goes by the name of [Associate name removed] who helped me threw all of my expensive quality purchases at this location to put a smile on my face as he always does before leaving out the doors of Raymour & Flanigan by setting me up for and exciting delivery date to receive my 1st and attractive Lean Mirror to bring my modern style of living into a heart warming place that I call "Mini Mansion" lol. Thank You Raymour & Flanigan / [Associate name removed]. 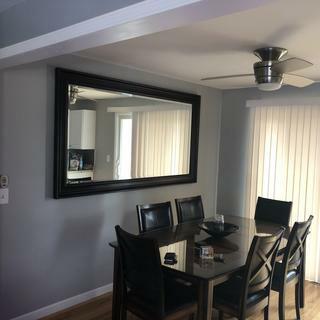 My wife just loves this elegant oversized mirror. We had the option of hanging it on the wall, but is too heavy. We opted for leaving it on the floor, slanted and secured to the wall. Everyone who comes to visit just lobe this mirror. This mirror is everything I was looking for! Pure Elegance! Added mirror to our “formal” room, looks great! My wife and I had just purchased new leather furniture for our formal room. We decided to add the Slade Leaner Mirror as an accent piece. What a difference it made. Added a nice touch of class. Thanks again to our salesman for assisting and ensuring everything was just perfect. We will be back! Mirror looks great, thanks Jay Beck! Gorgeous mirror. Mirror is beveled and high quality. The wood is beautiful. Love it. I love the size & quality!! This was a great buy!! 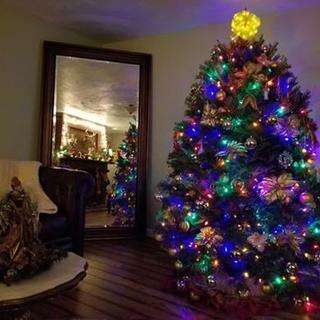 Beautiful Large Mirror. I am very pleased with this purchase. This mirror looks awesome in our bedroom! We have it leaning against the wall and it just helps make our bedroom feel larger and is functional when picking out your outfit for the day! Really happy we purchased this one over others we have seen at other retailers! Great price! I love the elegance this mirror brings to the room. Great buy at a great price. Mirror quality is excellent but unfortunately my delivery was terrible. The mirror wasn’t setup. Delivery people left item in box knowing it weight over 90lbs. I contacted customer service and got no help after explaining to them I have back problems and couldn’t move the box or mirror on my own. The mirror also had a small damage on it. They never offered to send someone to take the mirror out of the box or stand it up. What type of anchors would I need for this mirror? Where would I find them? BEST ANSWER: This is a leaner style mirror, meant to lean against the wall due to the size. We do recommend using professional heavy duty hanging anchors, to attach this item to the wall for safety. The anchors are available at your local home goods retail location. BEST ANSWER: The mirror weighs 96 lbs. Does this mirror come with the anchors to attach to the wall? Can this be hung on a wall? BEST ANSWER: This is a leaner style mirror, meant to lean against the wall due to the size. We do recommend using anchors to attach this item to the wall for safety.